My family has been enjoying a real food lifestyle for about nine years now. 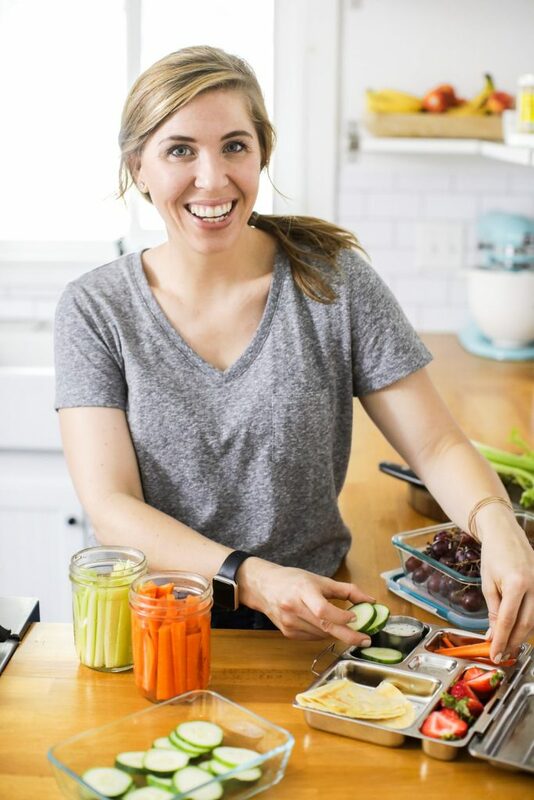 Over the years, I’ve found that two intentional acts have the greatest impact on our ability to enjoy good food, made with real ingredients, on a weekly basis: meal planning and keeping my fridge (along with my pantry and freezer) organized. We’ve talked a lot about meal planning in the past. And we’ll talk more about planning real food in the future. 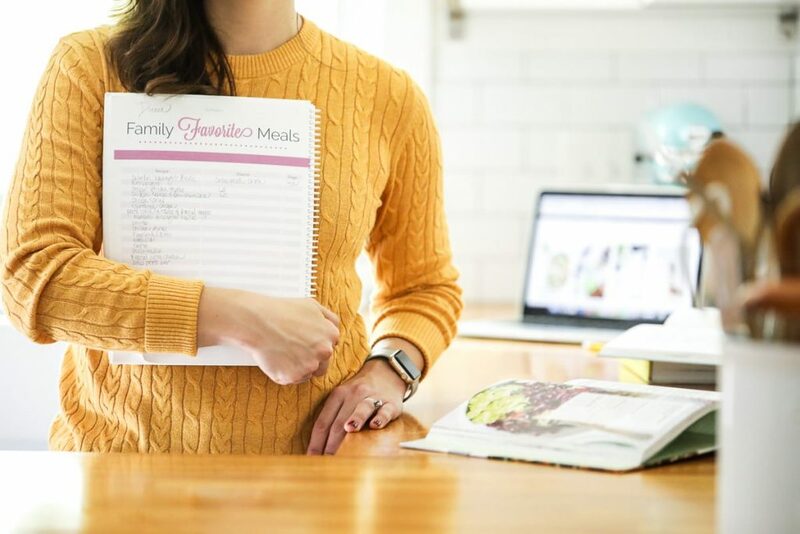 With meal planning comes prepping in advance, because once we know what we’re going to eat over a set period of time, it’s easy to work ahead as needed. Sometimes this working ahead means defrosting a whole chicken for dinner. Other times this means roasting an eggplant on the weekend to make a dip for future snacking. 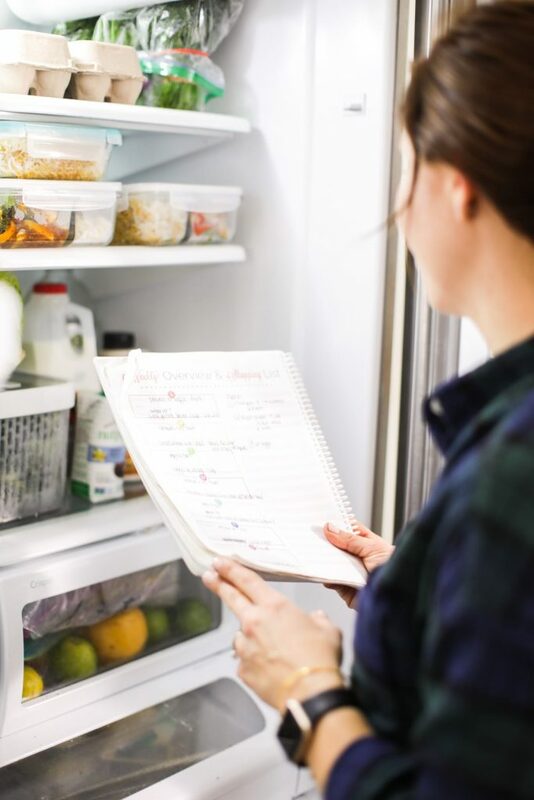 For me, keeping organized food spaces (pantry, freezer, and fridge) goes hand in hand with meal planning and prepping. Now, let me just pause for a moment because I know some reader friends may be rolling their eyes after reading that sentence. Friend, I’m with you! I don’t need to read another Pinterest article with perfectly-curated photos trying to convince me that my pantry and fridge are subpar. I’m all for aesthetically pleasing environments. I also believe strongly in practicality and simplicity. 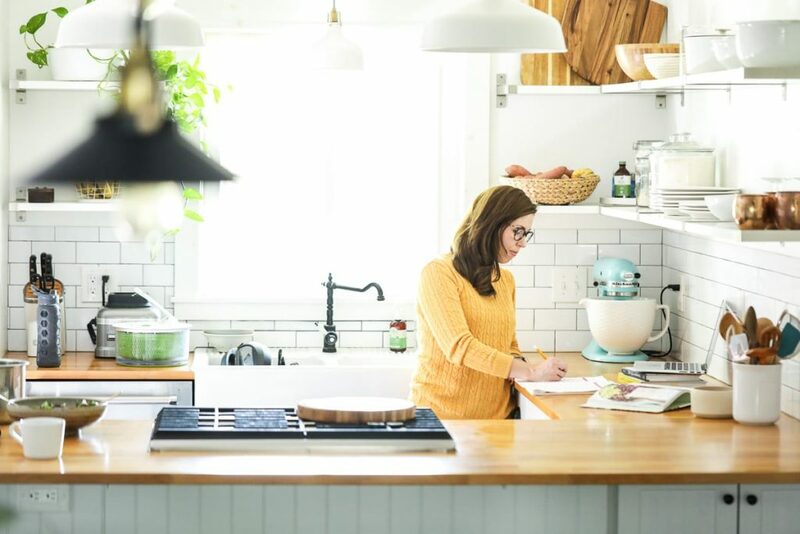 When I talk about “keeping organized food spaces,” I’m simply referring to the idea of taking a few practical steps to maintain organization within our food storage spaces. Why? 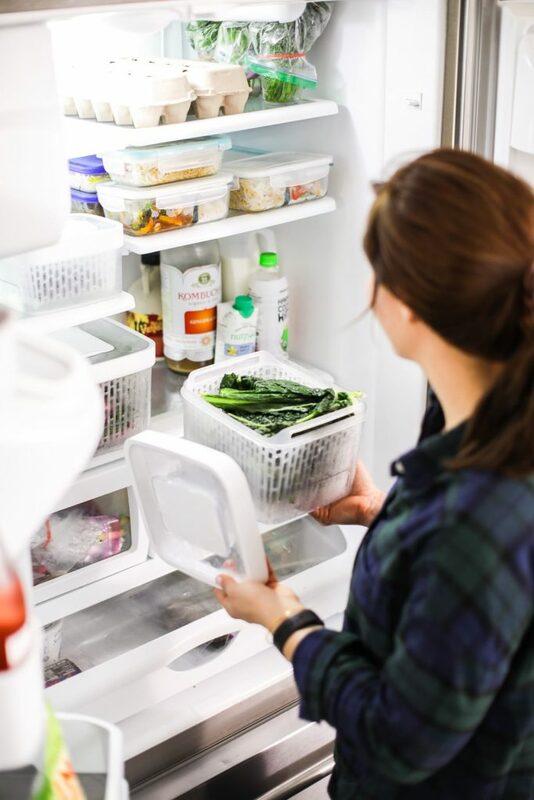 Because doing so allows us to easily find ingredients and make sure those ingredients are being used (and not rotting in the back of the produce drawer). That’s it. Practical, right? 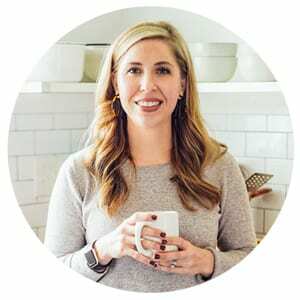 Having a plan for how to use our food (a meal plan), along with organized food spaces, sets us up for weekly real food success. Doing these things does require forming the weekly habit of planning and organizing. As Rory Vaden says in his book Take the Stairs, “Winning is a habit.” If we want to “win” at a real food lifestyle, we have to create habits (or some might call these “hacks”) that will help us do so. The key to keeping an organized fridge is to clean it out regularly. I’m talking about deep cleaning the fridge, too. 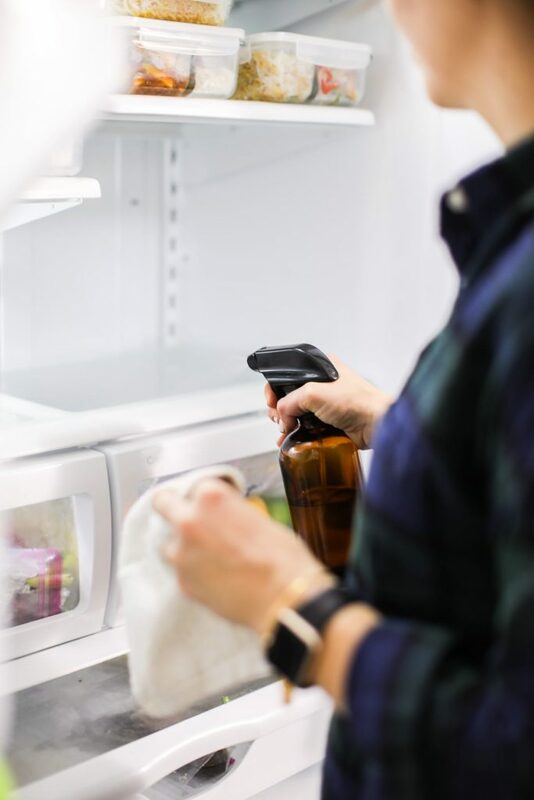 Remove everything from your fridge, take a mental inventory of what you actually use and what’s still good (read expiration dates, perform a sniff test), and toss anything that’s bad. Also, this is the time to grab an all-purpose cleaner and spray and wipe the interior. If you’re familiar with my house tending sheet, you probably noticed that I added this activity to my family’s monthly tasks. Personally, I like to deep clean my fridge once a month. I shop once a week for groceries. Before shopping, I open my fridge and take a peek at what I have leftover from the previous week, what needs to be used ASAP, and what needs to be tossed or composted (it happens). This maintenance check allows me to make informed decisions about my future meal plan, what I need to purchase, what I may be purchasing regularly that isn’t getting used (maybe I’ve been too ambitious about buying large heads of kale), and what I need to restock in the near future (mayo, mustard, ketchup). Now is also the time to quickly tidy up the fridge before adding new food. Grouping is my favorite way to organize my fridge. For me, this looks like grouping similar foods together in the fridge, such as: ready-to-eat foods (cut veggies, dips, make-ahead lunches, and leftovers), drinks, condiments, cheese, smoothie ingredients (flax seeds, bee pollan, hemp hearts, spirulina), leafy greens, herbs, berries, etc. Like items go together. I don’t use bins for grouping (other than for the cheese–we always have a lot of cheese in the fridge); rather, I place these groups in specific places within my fridge. Knowing where we can find specific items means that food doesn’t get lost in the black hole of the fridge. It also means that we’re in the habit of putting food back where it belongs, so that black hole doesn’t have a great chance of even forming. Now, let me just say that I have a family (two children and a husband), so keeping things in groups sometimes takes more effort on my part. And this idea isn’t about some Pinterest-perfect curated grouping. It’s more about being able to easily find food. When we first started eating real food, I purchased a pretty set of colorful Tupperware for food storage. I loved that Tupperware with all my heart, but I soon found that it wasn’t serving us well. The problem? I couldn’t see our food. And because I couldn’t actually see our food, I forgot about stuff. I found myself throwing away a lot of leafy greens, prepped foods, and leftovers each week. The solution? Replacing the colorful Tupperware with clear glass containers. By doing this, I was able to see what was in our fridge each time I opened the door. OXO Produce Keepers I have three medium-size bins for storing leafy greens and one small box for small berries. Pyrex Glass Storage Containers These are perfect for make ahead foods, dips, small ingredients (such as: blueberries or raspberries), and leftovers. Mason, Weck, or Le Parfait Jars These are great for storing homemade goodies, such as: broth, salad dressing, soup, nut milk, or even small berries. I also place fresh herbs in small jars filled with water and cover the jars with plastic bags and a rubber band at the base of the jar. Prep Natural Meal Prep Containers I just recently purchased these containers. I’ve been using them for make ahead (adult) lunches and leftovers that are turned into lunches. Large glass storage container This is for any random item that needs a large storage container, such as: strawberries, grapes, soup, etc. I stay away from using a lot of plastic bags for storage because they are easily lost in the fridge. And we all know what happens to food that gets lost in the fridge. With that said, I use plastic bags for uncooked bacon (the few pieces that will be cooked later in the week), celery, the random half of a cabbage, to keep similar loose veggies together in the veggie drawer, and to cover my fresh herbs (mentioned above). Instead of using a plastic bag for something like extra bacon, my plan is to try reusable Stasher Bags soon. I also just recently ordered a set of these cloth bags to keep similar items together in the vegetable drawer (bell peppers, broccoli crowns, carrots, and other loose veggies). Update: I’ve been using the cloth bags for loose veggies and fruits and keeping them in the fridge produce drawers. I absolutely love them. They’re great for grouping similar produce together, like: zucchini, peppers, apples, citrus, carrots, etc. This is the organizational method that’s worked well for me. 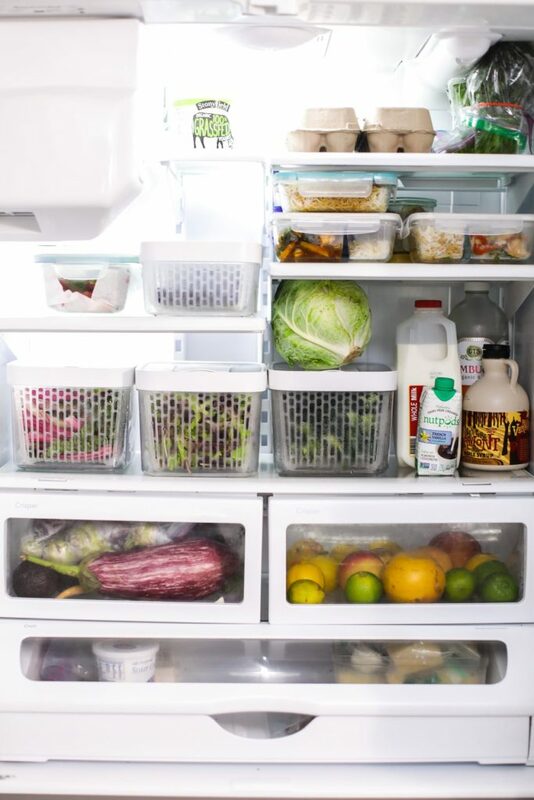 Do you have a specific method for organizing your fridge? What’s worked for you? I don’t know why but forgetting things in the fridge or even being able to find the stuff I know is in there is a struggle of mine! LOVE those partitioned glass containers you posted – can’t wait to try them out! I know what you mean, Carol! It can be a real struggle. I absolutely love those containers–they’ve been great for prep-ahead lunches for me. Maybe I missed it, but what is the source for the large vegetable bins with basket inserts? Hey Dawn, They’re called OXO Produce Keepers: http://amzn.to/2GtyqWc. I have three medium-size ones and one small one. What happened to the Snapware you used to have? I know I keep looking at those Oxo produce keepers. I keep putting it off because I think they are plastic, and I have tried really hard to replace all my plastic containers.. It’s so hard to find a container the right side for carrots though, they go bad so much faster outside of a plastic bag ?. I love to see a clean fridge with visible organized contents! I still can’t make mine look just like that though, because I have these half gallon jars of whole einkorn flour and masa harina and pickled beets lol. Is it weird that I care? Hey Bethany, Good question. I still use the snapware for leftovers. But I found they were a bit too small or oddly shaped for weekly storage of prep ahead foods and cut veggies and fruits. That’s when I switch over to the Pyrex containers (they fit better in my fridge and stack well) for the prep ahead stuff. I’ve been keeping my carrots in the cloth bags, in the produce drawers, and they seem to keep for a while like that. I also recently bought more cloth bags (this brand: https://amzn.to/2qMOonk) and have been storing my carrots in them (in the produce drawer still). My only complaint about those bags is you can’t see through them (so the visible piece is gone). One note I should have made…we do have a second fridge out in the garage. I store all my flour out there, along with nuts and seeds. And beer, lol. That has helped with fridge storage. Lol, not weird at all. There’s something about a clean(ish) fridge.